How Does Winter Effect Hair Loss? There has been a long held belief that people tend to lose more hair in the winter, so as the colder weather is just around the corner, it can be a worrying time for those who have concerns about thinning locks. Although the idea that cold weather promotes hair loss continues to persist, lower temperatures in themselves do not have any effect on the amount of hair that is shed. In fact, studies have shown that people often lose least hair during the colder months. However, there are other factors at play which cause excess hair loss at this time of year. The environmental changes that we experience during the winter can dehydrate the scalp – we are moving from a cold outdoor environment into the centrally heated indoor environment and the result of these rapid changes is a dry scalp paired with brittle hair. This damage is then exacerbated by wearing a hat, as the friction and stress on the strands of hair could end up causing clumps of hair to fall out. Taking proper care of your hair during the winter is very important to prevent the damage which can result in hair loss. Ensuring the scalp and hair remain well moisturised is key, and using a rich conditioner at least once per week is a good way to help minimise any damage. A shampoo which contains natural essential oils and shea butter, and which has no alcohol or harmful chemicals will help to guard against dry, frizzy hair which is prone to breakage, giving you the best possible chance to reduce the amount of hair lost during the colder months. Another issue which may be experienced during the winter is seasonal hair loss. Everyone loses hair on a daily basis, with the average number being around 50 to 100 strands. However, at some times of year, the number will be closer to the upper end of that range, meaning that the loss is a lot more noticeable. As the most common time for this to happen is in October and November, it contributes to the idea that winter causes hair loss. The problem is actually called seasonal shedding, and while it is primarily noticed in women, it also occurs in men too. The good news is that seasonal shedding is usually nothing to be concerned about, however if you think that more than 100 strands are being lost each day, or if you notice bald patches starting to appear, it could be a sign of pattern baldness instead. If you are worried about your thinning hair, you may want to look at ways of disguising the problem. 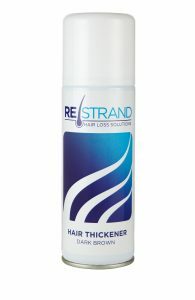 A hair loss concealer spray is one of the best options, since it coats the individual strands of hair to make them appear to have more texture whilst also looking thicker and fuller. Simple and convenient to use, a hair thickening spray can help to restore your confidence and to make you look and feel much younger.